I thought of this as I was writing the previous post, but decided that it was important enough that it deserved it’s own discussion. Another benefit of physical agile boards is that, by their nature, they tend to limit the scope of your planning. To some, this may sound like a bad thing. It is actually one of the most difficult disciplines to maintain in agile development. One of the things that distinguishes agile development from older development models is that Agile keeps the time horizons close. This is beneficial because the nature of software and systems development is ever changing, and long-term plans are almost always upset by the realities of the industry and of development itself. Even strong agile teams see opportunities and features that don’t make sense right now, but they know they will want “someday,” The tempting thing in Scrum is to add these into the backlog, so that they aren’t forgotten. In Kanban, they may go into the “not started” column or some other “feature stash” (The Product Owner and I had a secret Trello board called this when I worked on Revel at Adobe). These far-off stories and epics become their own drag on the agile process, slowing down backlog grooming and sprint planning as the backlog becomes less and less manageable and stories get re-added because no one can find anything. A physical board actually makes it physically difficult to do this kind of faux-waterfall long-term planning. There just isn’t anywhere to put the post-its/cards! The Product Owner may still have their personal feature stash somewhere, but it won’t become a drag on the whole team. Similarly, the lack of physical space makes it difficult to over-plan the stories that are in front of the team too. When I was doing Scrum as front-line engineering manager, I found it difficult to figure out how many stories we should break down for a sprint in order to not run short. The tendency was always to task out a lot more stories than we needed, just-in-case. The virtual board makes it easy to plan as many stories as you want. In practice, stories have dependencies on each other and if you over-plan, you tend to just write incorrect tasks. A physical board encourages you to plan just as much as you need, and not much more. After years of exclusively using virtual Scrum and Kanban boards, I am using physical boards again. In the process of adapting, I’m rediscovering many great things about using a physical board. One benefit of a physical board that I didn’t expect is that your stories and tasks tend to be less formal. The other (which I didn’t get a picture of) was “do the thing with the thing“. A good agile coach would point out that both of these were under-specified and poorly written. A better agile coach would point out that as long as the whole team understood what they meant and there was an agreed-upon definition of done, then the wording doesn’t really matter that much and it is fine for the squad to have an occasional story like that. Neither of these would have ever appeared on a virtual board. By being on the computer/net, the virtual board has two features that the physical board does not. One is longevity. “Do the thing with the thing” is fine if it is a story under discussion every morning at standup, and tossed in the trash when it is done. “Do the thing with the thing” would be a cryptic mind-f*ck a few years or even weeks later if someone was reviewing old stories. Now this longevity element is something that I used to like with the virtual boards, having the history and being able to see how things developed and where they came from. In reality, you don’t really ever have time for that and instead it becomes another digital barnacle that isn’t really that useful. Another property of a digital board is transparency. Theoretically, anyone in the company can see it. This again, is both a positive and a negative thing. Having a board that anyone can see means that what your team is doing, will do and have done is available to anyone. Status reports are (theoretically) not necessary. If anyone asks what you’re working on, you can tell him or her to go look at Trello/Pivotal/Jira/etc and bug you if they have any questions. With a physical board though, they need to come to the team and look at the wall. This means that any misunderstandings can be cleared immediately, and communication is actually improved by, you know, people speaking to each other. When you are creating stories, tasks and notes on a virtual board, you are writing for an indeterminate audience. You are writing for yourself and your co-workers, but you never know who else will be reading it. If something you write has to make sense to anyone, ever, you will be a lot more guarded in what you say. You will be wary of not only how the story is perceived, but also, how you as the author are perceived. It is the difference between the conversation you have with a coworker over a beer and the item that you post to a blog or twitter. That consciousness of the potential audience takes all the spontaneity and fun out. The formality makes stand-ups and planning take longer as well. If you work on a co-located team and are using a virtual board for your agile practice, try going old-school for a while. I’m betting that your stand-ups and planning will go a bit smoother if you know that the stories and tasks that you write are for your team’s eyes-only. Whatever you do, don’t forget to do the thing with the thing, and while you are at it, unf*ck everything. Well, part of the whole idea is that scrum isn’t a hard-and-fast set of rules right? I had some meetings at another office last week which necessitated moving out our first sprint review and retrospective a couple days. So if one of the guiding principals of scrum (and agile in general) is that the dates don’t change, everything else does, that got blown right out of the gate. Some new stories came up as part of the sprint wrap-up which means that we’ll need to do a new planning poker session. Also, some other things came up which mean that there is a bit of housekeeping to do before we start the second sprint. We’re now in some uncharted zone between two sprints while the product manager and scrum master do some cleanup while the scrum teams do some off-book work for a couple days. Yeah, not ideal, but we’re trying to get it back on track. This sprint was going to be a throw-away anyway as it involved a lot of transition and getting used to the framework. The retrospective brought up some really good issues and some innovative suggestions from the team on how to handle them. If the suggestions work out, I’ll post them here eventually. There are still some folks unclear on what we expect to gain by transitioning to a new development process, but most of the team is embracing it as a good experiment and chance to try something new. For the most part, everyone seems to have an open mind and that definitely makes a huge difference as we all try to figure this out together. It hasn’t been the smoothest transition, but so far so good, I think. We’re definitely not as productive as we were before (so far). However, I think that the discipline provided by the product backlog means that we are actually getting the most important things done first. That makes a huge difference. 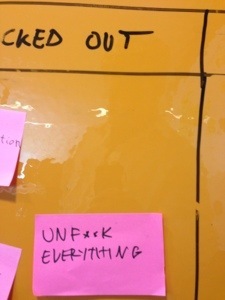 We were looking at a demo of an agile-project tool yesterday. The tool itself was pretty good, but I just kept thinking about how I could write it myself and how much fun that would be. Then, once I looked at the cost of the license, I had to restrain myself from taking a week off and writing a competing tool that I could release as open source or sell at half the price. Oh build-vs-buy, you always throw a bucket of ice water in the face of my reveries!